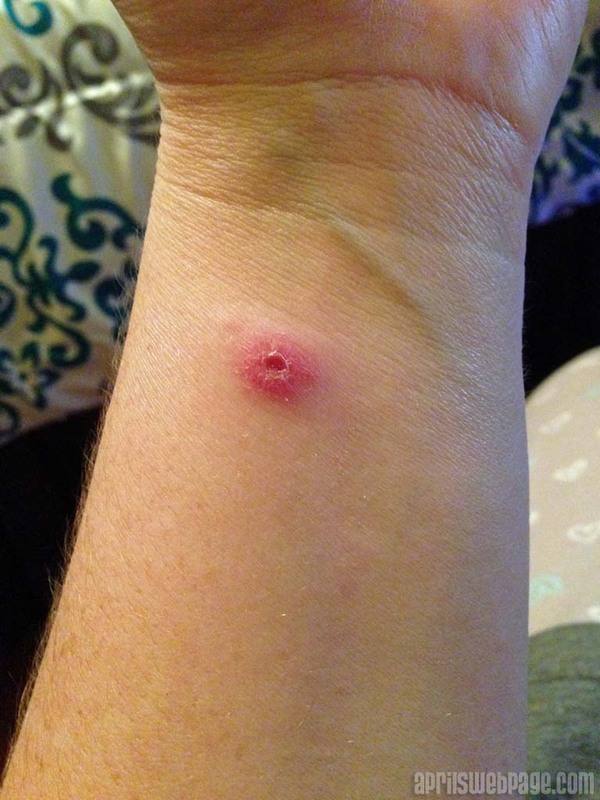 I learned a rather important lesson for this possible spider bite: go to the doctor if it hasn’t improved within a few days of using a topical antibiotic like Neosporin. 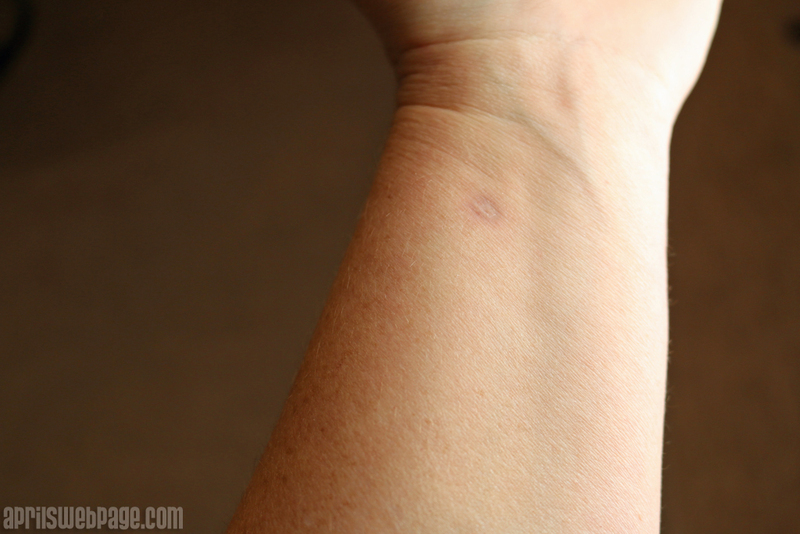 I don’t know for sure what bit me; I never saw anything on my wrist or felt anything. This happened at the very end of August last year. 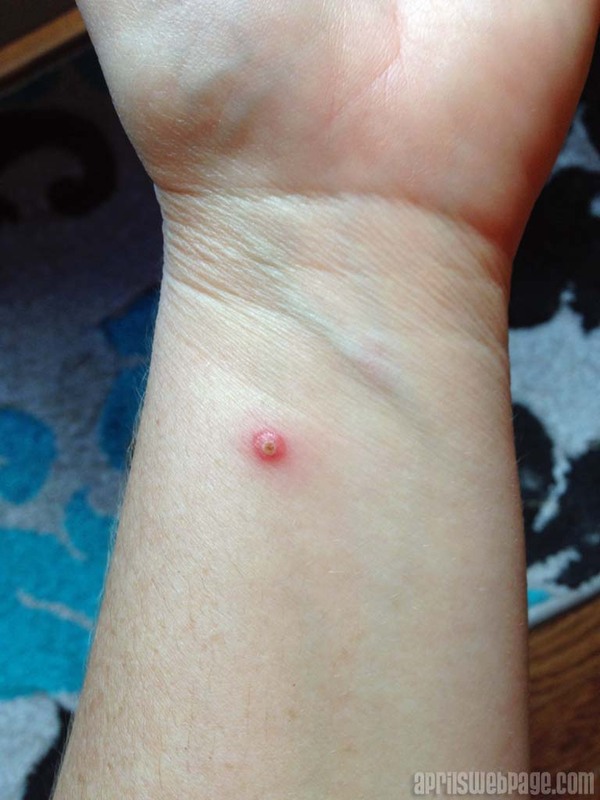 I woke up one morning and discovered a spot on my arm that resembled a pimple, but it didn’t hurt like one. I snapped this picture on August 30th. I just treated it with Neosporin, but it wouldn’t heal. It didn’t help that with it’s location, every time I showered, I wound up destroying what little scab might have formed, no matter how careful I was about drying off. Band-aids didn’t do much help either. 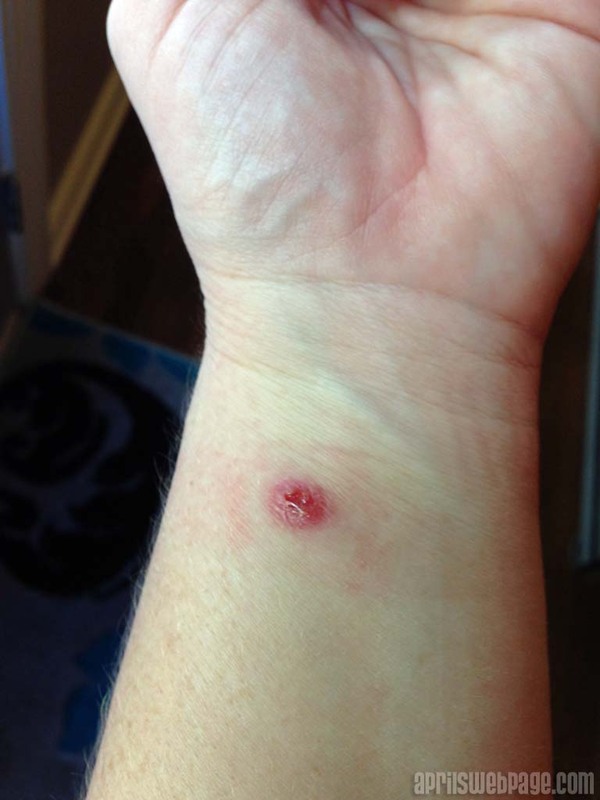 This is what it looked like 16 days after the bite. At this point, I should have already went to the doctor. A few that have been bitten by a brown recluse said it looked just like their bite. However, when I searched the internet, I was convinced it was not a brown recluse bite. The pictures I saw of bites that were just 7-10 days old were much worse than mine at 18 days. We’d actually had a friend visit with us in July who had a brown recluse bite on her leg, and it was nasty looking and so much larger. I just couldn’t believe mine was a brown recluse bite. Alex said it could have been a baby spider, so it wasn’t quite as venomous. That worried me because that meant there were probably more of them somewhere I’d been. 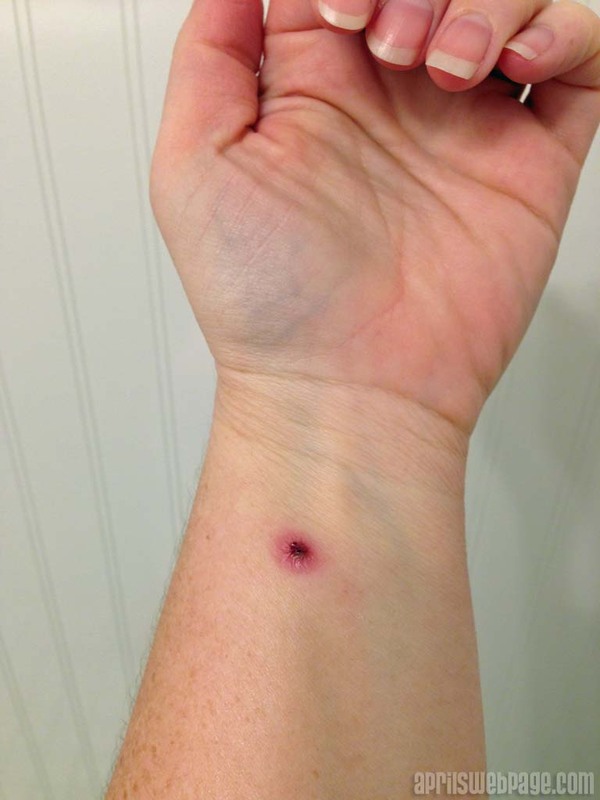 The picture below is 22 days after the bite. It’s got a somewhat crater-like appearance in the middle now. 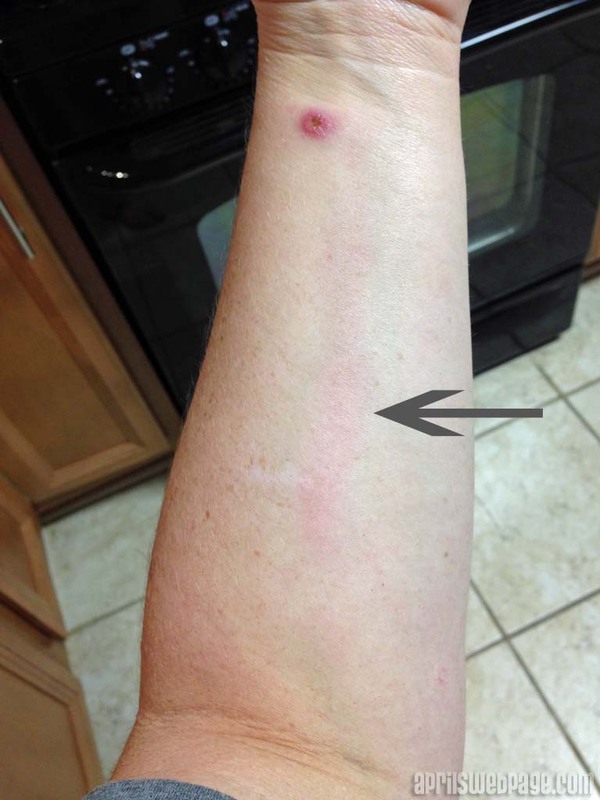 On day 23 (Sept 22), I decided to go to the doctor because I noticed a red line down the length of my arm, and I knew that wasn’t a good sign. The doctor diagnosed this as lymphangitis. He prescribed an antibiotic, gave me a tetanus shot, and sent me on my way. Obviously he couldn’t tell me what had actually bitten me, for those wondering. I do wish I’d seen whatever it was. Two weeks after going to the doctor, I went back. I had already taken one week’s worth on antibiotics and been off of them for a week, and it still didn’t look like it was healing like it should. 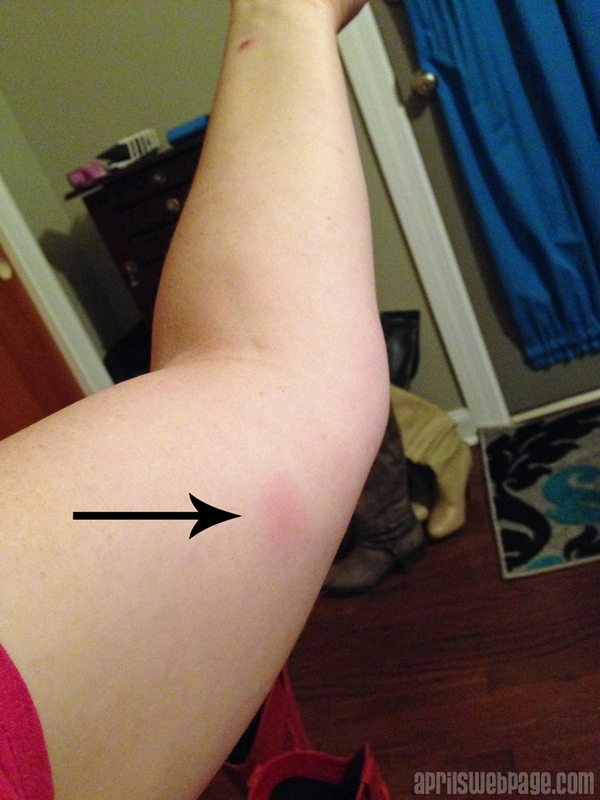 I was also concerned about the knot forming further up my arm in a lymph node region. At this point, I could not stretch my arm out straight because of the tightness and pain around my elbow area. It didn’t throb, and it wasn’t enough to take pain medicine. I just knew it wasn’t normal, and it was enough to prevent me from fully extending my arm. The doctor wasn’t concerned about the knot, even though I’d finished my antibiotics a week prior. He just prescribed me some hydrocortisone cream for the bite area. After 6 more days of it getting a little bigger, I decided to go to a different doctor (Oct 12). They prescribed a different antibiotic (previous doctor prescribed a gram-negative or gram-positive antibiotic, so this doctor prescribed the opposite to make sure the bacteria was wiped out). They also measured the knot and told me to come back in a week to see if it had decreased in size any. If it hadn’t, they’d biopsy it to make sure it wasn’t something more serious. A week later, I returned for my now fourth visit to the doctor because of this, and they said it appeared to have decreased a little, so they held off on biopsying it. They did prescribe one more week’s worth of the antibiotics. The redness around the bite (what you see in the two pictures above) was actually the forming of scar tissue. I thought it still wasn’t healing, but they said it looked to be the beginnings of scar tissue due to necrosis. It took weeks for the knot close to my elbow to completely go away on my arm. There were times I debated on going to another doctor because my paranoid mind ran through all kinds of horrible scenarios. But it finally went away sometime in December I think. I can’t remember when I actually realized it was gone. 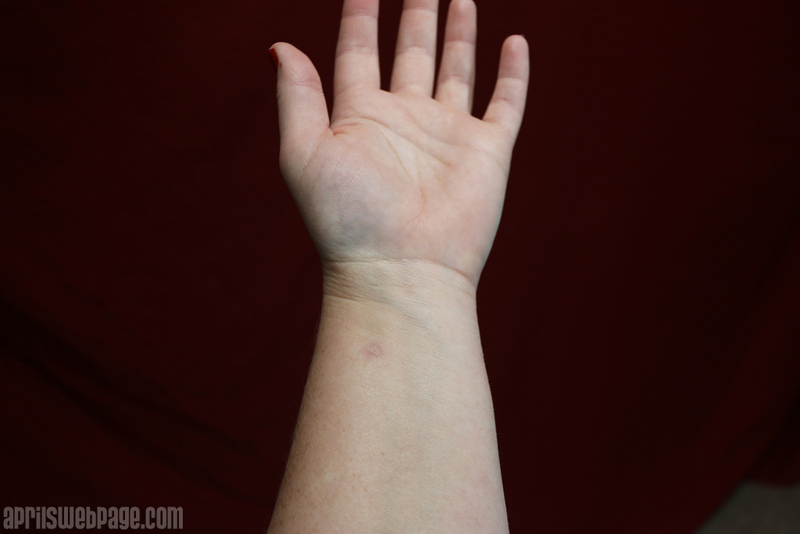 I was concerned I’d have this awful red bright spot on my wrist from now on, but the scar tissue has faded considerable. These 2 pictures were taken earlier this week, 7 months after the bite happened. Instead of one copay of just $40 had I gone within the first week, it wound up costing me $160, plus $45 in medications, which included 3 rounds of antibiotics and a hydrocortisone cream. Never, ever again will I put off going to a doctor if a bite or wound on my body doesn’t show major signs of improvement after 3-5 days. As I think about the timeline for when all of this occurred, I can’t help but wonder if this bite had anything to do with the unusual pain in my leg that I posted about in December. As I mentioned in my post, the more centralized pain that was more on the side of my leg rather than the front of my leg began sometime in September (after what I thought could be shin splints had went away). This didn’t feel like bone (shin splints). Once this pain went away (or so I thought), I started back to Zumba but it would come back – not full force like before but as a dull ache to remind me that it was still there. Once while doing Zumba, I thought it was just sore muscle since I hadn’t exercised in quite some time, so I pressed my thumb down on the general spot and rubbed it like a massage therapist would, and when I hit that specific spot, it hurt. And not in a sore-muscle way. I don’t know what this is. I didn’t injure myself while exercising last year; this just gradually came on. I still worry about that spot to this day and am afraid to start running or doing Zumba full-force out of fear it will come back and put a halt to my preferred exercise methods again. I haven’t done any walking and jogging training since last year when the leg and foot issues began. I am doing Zumba again, but not as vigorously as I once did. I am going to gradually start adding jogging back into my routine this week. I did a little jogging on Monday with no issues, and yesterday during Zumba there wasn’t a even a hint of anything wrong with my leg in that area. I’m going to incorporate a little more jogging into my walk today, like I did last year where I gradually kept adding a few more stretches of distance to jog as I got better and better. If the pain in that area comes back as I continue to exercise more vigorously, I will see another doctor. 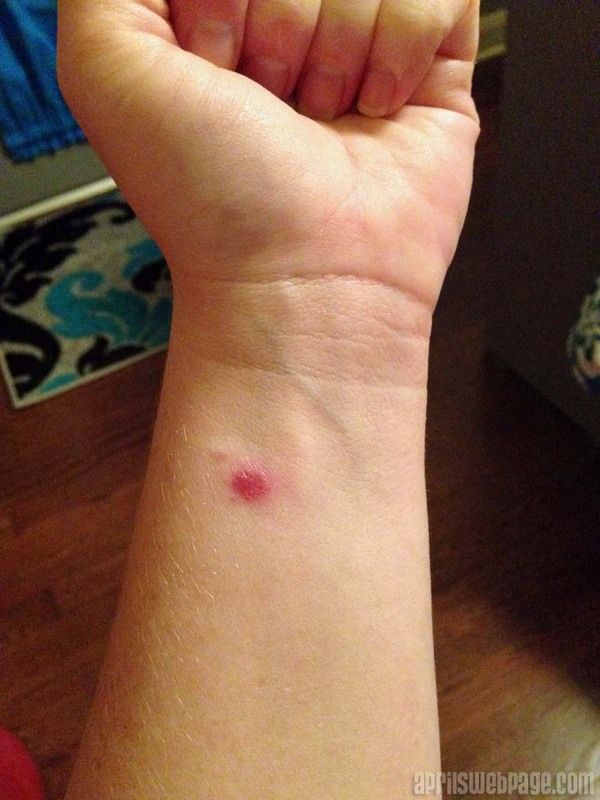 I will also mention to him/her the possible spider bite that happened a month or two before the issue began. I just want peace of mind that it’s not something more serious.